On 6 January 2019, shortly after midnight, unknown persons opened fire at an Egged bus near the settlement of Beit El in the West Bank. The windshield was damaged and the driver was lightly wounded by the broken glass. The Israeli military and Border Police immediately deployed a large number of troops to the al-Birah industrial zone and started confiscating security cameras from businesses there. At around 7:00 A.M., residents of al-Maqahi, a neighborhood in the town of al-Birah, noticed some 15 Border Police officers combing the area for security cameras. The officers hurled tear-gas canisters and fired rubber-coated metal bullets at a group of teenagers who were throwing stones at them. At the same time, Fawaz ‘Abed (Faraj) and his friend Amjad Qar’an – both 16 years old – were meeting to have coffee in the neighborhood. They had met as they do every morning before ‘Abed goes to school and Qar’an goes to his internship as an electrician with the electric company. 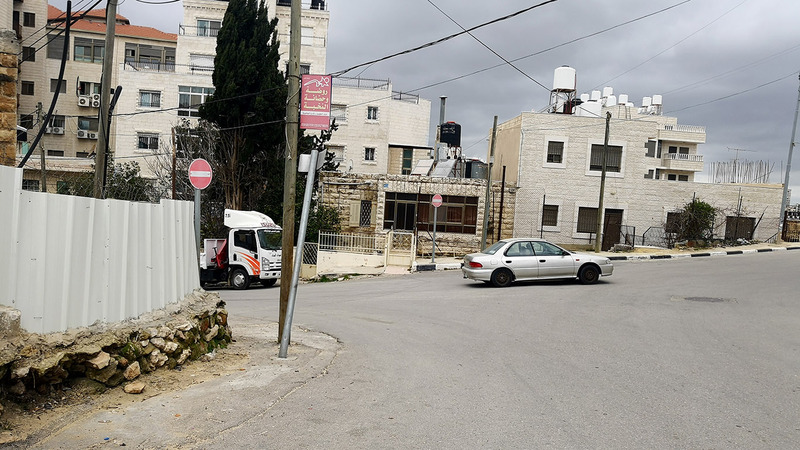 The two boys learned via social media that Israeli security forces were in the neighborhood. They waited nearby for the troops to leave. At around 7:45, the two boys heard that the soldiers and Border Police had left. They approached the intersection coming up to the al-Maqahi neighborhood and peered out from behind a building. They saw Border Police officers about 40 meters away. Some of the officers waved at them and ‘Abed waved back, in an attempt to understand what they meant. Meanwhile, two other officers came up suddenly from a side street located to the boys’ right. One officer, without any warning, fired a sponge round at ‘Abed’s head from less than 10 meters away. ‘Abed fell down, bleeding. When Qar’an tried to go over to him, the officer fired another round in his direction, but did not hit him. Amjad and I were standing behind a wall at the intersection. Amjad was behind me and I was following the police officers, who were about forty meters away. Two or three officers waved at us. I waved back and shouted, “What do you want?” That went on for a while until suddenly, I felt something hard hit me on the right side of my forehead. I was shot at from close range. I don’t know what it was, a rubber bullet or something else. The impact was so strong, I couldn’t breathe or see for a moment. I fell down and started writhing and thrashing. I couldn’t see anything clearly. I heard Amjad call out to me: “Come here, come here.” There were police officers around me, but I didn’t know how many. One or more kicked me. I don’t know whether they were doing it to hurt me or to check that I was alive. I was semi-conscious. I remember trying to drag myself along the ground to reach Amjad, but I couldn’t hold myself up and I couldn’t stand. I don’t know what will happen to me now. It’s scary. I’m supposed to be in the middle of my midterm exams. I’m missing school and might fail. I still don’t know when I’ll go back to school. I don’t even know whether I’ll fully recover or be stuck with medical problems that could mess up my life. When we heard from kids in the neighborhood that the soldiers were about to leave, we walked towards the intersection and peeked out from behind the wall of one of the houses there. We stuck our head out, took a quick look and then hid behind the house again. A few minutes later, some police officers waved to us from about thirty or forty meters away. It didn’t look like they were about to chase us. Two officers showed up on our right, without our noticing. They must have suddenly come out of the metal stairway. They came up to less than ten meters away from us. One of them fired at Fawaz. He was hit in the head and fell over, about two meters away from me. I didn’t even notice the officers until he was hit. It was only after I heard the shot and saw Fawaz fall that I saw them coming up from our right, from the direction of the stairs. I shouted to Fawaz to get up, but he didn’t answer. He was semi-conscious. I saw that his head was bleeding in front, on the right side. I wanted to help up and started going towards him, but the officer fired another sponge round, this time at me. It didn’t hit me. I ran away and went to get my family. As I approached the spot where Fawaz was lying on the ground, I could see there were Border Police officers next to him. It was too far to see what was wrong with him exactly. When I got close, one of the officers motioned with his gun for me to go back but I wouldn’t, because I was afraid something bad would happen to Fawaz. I kept coming closer and saw a blood stain next to Fawaz’s head. He was rolling about but couldn’t talk or get up. The officers didn’t give him first aid. I shouted at them to stay away from him, that he hadn’t done anything wrong and didn’t have a weapon. There wasn’t even a stone next to him. I asked them: “What did he do to you, that you shot him like this?” They didn’t answer. They spoke with each other in Hebrew, which I don’t understand. The officer kept pointing his gun at me. I told him I wasn’t afraid of him and that he should go ahead and shoot me if he wanted to. I went over to Fawaz and the officers started backing away. Fawaz was squirming and mumbling, but I couldn’t understand what he was saying. Some other neighbors showed up, and so did my mother and sister. My sister called for an ambulance but it was held up. We don’t know why. After about ten minutes, we decided to drive Fawaz to hospital. The officers did not offer Fawaz ‘Abed medical assistance and residents took him in a private car to the Red Crescent hospital in al-Birah. He was then transferred to the Palestine Medical Center in Ramallah, still unconscious. The doctors found he had a skull fracture and an intracranial hematoma, and he underwent surgery. ‘Awad was released on 9 January 2019, after three days in hospital. B’Tselem’s investigation indicates that a Border Police officer shot 16-year-old Fawaz ‘Abed in the head from about 10 meters away, with no justification. Firing sponge rounds at minors is completely prohibited. Moreover, firing sponge rounds from such close range at a person’s head is also prohibited, as it may prove fatal or cause serious injury – as occurred in this case. Yet rules are one thing, and reality on the ground another. The orders issued to prevent injury and death primarily serve Israel’s security forces to keep up appearances. They are no more than hollow statements. In practice, breaching the open-fire regulations is not punished and the law enforcement system is quick to whitewash such incidents. Violence without accountability lies at the heart of the occupation. It will continue so long as the occupation does.